Help us in our mission to make more people aware of the benefits and wonders of astrology. 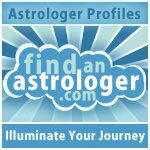 Share this FindAnAstrologer.com banner on your website or blog. You may post the image below with a link back to your favorite page on FindAnAstrologer.com. You can Right Click the banner on the left, save and create your own HTML. OR JUST COPY the code below. You may replace the link to the home page with any link you choose.